If you’re prepared to do a 3.5 km uphill hike from Lake Louise you’ll be rewarded with this view of Lake Agnes. There’s a tea room just out of shot where you can buy hot drinks and enjoy the sun rise. The people that work there hike up and stay there for 6 days at a time to serve the weary hikers. There’s nothing quite like an alpine breakfast that you’ve earned through hiking. 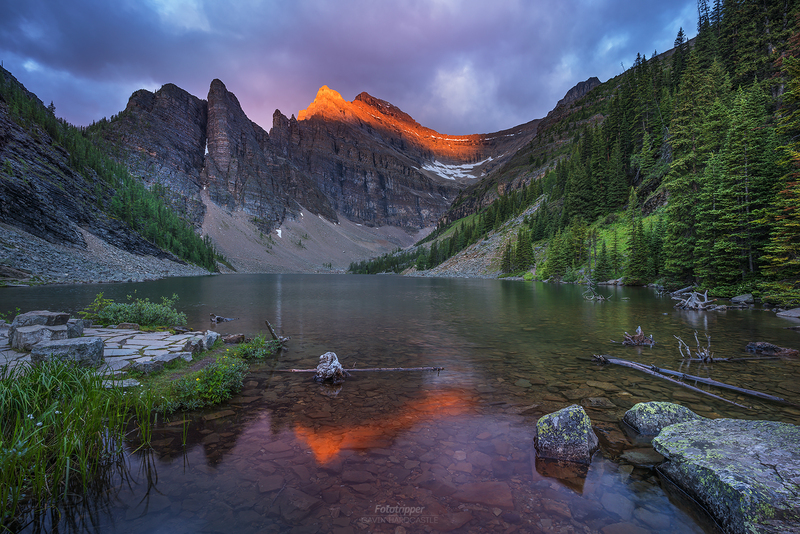 From the moment I arrived at Lake Agnes that morning I had little hope of a break in the clouds. That’s the beauty of the Canadian Rockies, even when you think there’s zero chance of getting any good light the clouds often open up just long enough for the patient photographer to catch that special moment. Experience has taught me to ignore my instincts and stick around under the gloomiest of cloud cover. Sometimes that gamble pays off and this was one of those times. I enjoyed a few glorious minutes of alpen glow having already scoped out my spot to make sure I was ready if the moment arrived. A quick coffee at the tea house recharged me for the walk back down the mountain just as much as my smug smile.